= Echinocereus engelmannii var. variegatus (Engelm. & J.M.Bigelow) Rümpler in C.F.Först. Accepted Scientific Name: Echinocereus engelmannii (Parry ex Engelm.) Lem. Origin and Habitat: Arizona (Mojave County to House Rock Valley and the Navajo Bridge, mainly not of the Colorado canyons), USA. Type locality: Head of Bill Williams River, Mojave County. Altitude range: 1,080 to 1,705 metres above sea level. Habit and ecology: This species dwells in desert soils and grasslands. Echinocereus engelmannii var. variegatus (Engelm. & J.M.Bigelow) Rümpler in C.F.Först. Echinocereus engelmannii (Parry ex Engelm.) Rümpler in C.F.Först. Echinocereus engelmannii var. chrysocentrus (Engelm. & J.M.Bigelow) Rümpler in C.F.Först. Echinocereus chrysocentrus var. purpureus (L.D.Benson) hort. 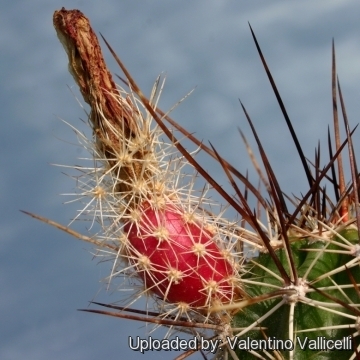 Description: Echinocereus engelmannii var. variegatus is a local or morphological form of the widespread and variable Echinocereus engelmannii. It differs from the type variety mainly for its lowermost central spines mainly 2.8-4.5 cm long, often markedly differing in colour from other spines and varying from white to brown often mottled with black. 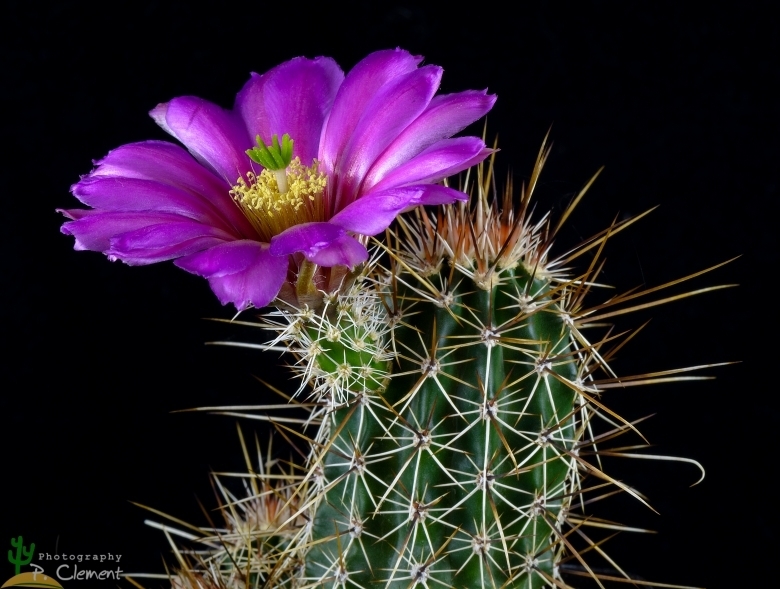 However the distinguishing characteristics of Echinocereus engelmannii var. variegatus, appear to fall within the natural variation of Echinocereus engelmannii and it should be synonymized with the latter, but it still has a value for a collector because they identify plants with particular characters. Derivation of specific name: 'variegatus' Lat., mottled, variegated; for the variable spine colours. Habit: Echinocereus engelmannii var. 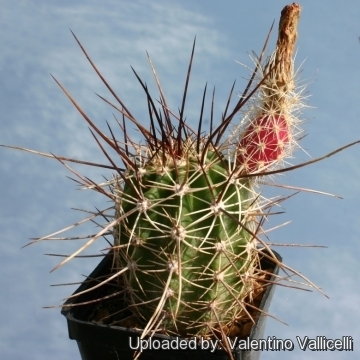 variegatus is a small mound-forming cactus with nearly black clusters of 2 to 12 erect stems. Stems: Sark green 10 to 20 cm tall, 2 to 5.5 cm in diameter. 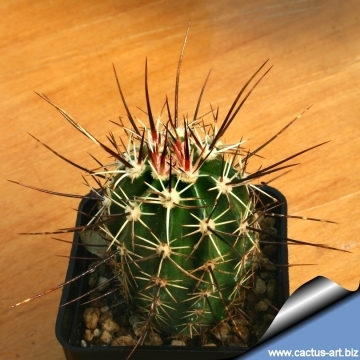 Spines: Highly variegated (variable) in colour, being either white, horn-colored, dark-red or black; lower central 3.75 cm long, straight, stiff; other centrals shorter, darker in colour. The three upper centrals often curved. Flowers: varied in colour from pink to purple to magenta. 5 cm (2 inches) in diameter, 5 cm (2 inches) long. Fruits: Spiny, 3.75 cm long, red when ripe. Seeds: c. 4 mm wide, black. Echinocereus engelmannii (Parry ex Engelm.) Lem. : ( var. engelmannii) ha 4 to 6 central spines whitish, golden-yellow, reddish brown to nearly black. It is a highly variable species. Distribution: Southwestern USA (California, Nevada, and Arizona) and northwestern Mexico (Baja California and Sonora). Echinocereus engelmannii var. acicularis L.D.Benson in L.D.Benson: has only 2-4 central spines and more robust habit. Distribution: California, Arizona, Baja California and Sonora. Echinocereus engelmannii var. armatus L.D.Benson: is the most formidably spiny extreme of the species, central spines up to 13 cm long. Distribution: California and Nevada. Echinocereus engelmannii var. chrysocentrus (Engelm. & J.M.Bigelow) Rümpler in C.F.Först. : has 5-6 very stout yellowish to brown central spines, up to 7 cm long (or more), but it is very variable. Distribution: California, Nevada, Arizona, and Utah. Echinocereus engelmannii var. howei L.D.Benson: Distribution: California and Nevada. Echinocereus engelmannii var. munzii (Parish) W.Pierce & Fosberg: is a mountain form with white spines twisting up up from small bodies, with 4 central spines (except in an occasional areole) instead of 1 and magenta flowers. Distribution: California and Baja California. Echinocereus engelmannii var. 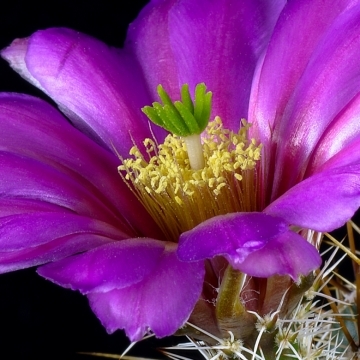 purpureus L.D.Benson: is a dark-colored, short-spined morphological form that occurs interspersed throughout populations of Echinocereus engelmannii var. chrysocentrus. Distribution: Utah. Echinocereus engelmannii var. variegatus (Engelm. & J.M.Bigelow) Rümpler in C.F.Först. : has multicoloured dark-colored spines, typically the central spines are long red or black and contrasts nicely with the white radial spines. Distribution: Arizona and Utah. Cultivation and Propagation: Echinocereus engelmannii var. variegatus grows rather slowly and it is sensitive to overwatering (rot prone) and needs a very good drainage to avoid rotting, but requires more moisture than true desert cacti to grow and produce flower.